NCAA moves to prop up cartel with tougher penalties. 2/12/2012: At its heart the NCAA is a classic hiring cartel. College athletic departments agree among themselves to all pay the athletes a bare minimum, so that the bulk of the profits can be used for inflated salaries for the coaches, assistants, athletic directors, and of course the NCAA administrators. The catch is that every college has an incentive to cheat, and offer top players a better deal – a few thousand in cash from a booster, a loaner car, good deal on an apartment, and so on. If this gets out of hand the players get the profits, and the cartel can collapse, leaving little money for the NCAA insiders. … It threatens serious payback for programs and individuals involved in what the NCAA terms the “worst of the worst” cases, involving such things as academic fraud, significant payments or other illicit benefits for athletes and a finding of a lack of institution control. 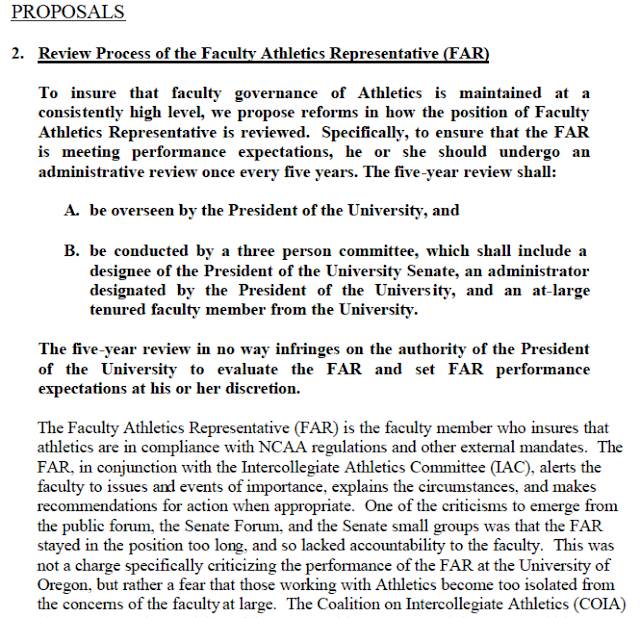 The people charged with delivering this “constructive fear” to those evil programs that want to compensate athletes for their work are the members of the NCAA Infractions Committee – including UO’s own “Faculty Athletics Representative” Jim O’Fallon. This never happened. Weird. O’Fallon’s contract is here. O’Fallon even gets called out by NYT financial columnist Joe Nocera, for this inane, officious decision penalizing a school for giving athletes books. Recently, Mark Emmert, the president of the N.C.A.A., tried to make the rules a tad less onerous. He got the N.C.A.A. board of directors to approve an optional $2,000 stipend as well as a four-year scholarship instead of the current one-year deal for players. And how did the cartel react to these modest changes? It rose up in revolt. Enough universities signed an override petition to temporarily ice the new stipend. The same thing happened with the four-year scholarship. At the N.C.A.A. convention in mid-January, both of these rules will be reviewed. In all likelihood, the N.C.A.A. will roll them back. However benignly it characterizes this action, it will be as clear-cut an example of collusion as anything that goes on at an OPEC meeting. How can it be that the N.C.A.A. can define amateurism in one moment as allowing a $2,000 stipend and in the next moment as forbidding such a stipend? How can it justify rolling back a change that would truly help student athletes, such as the four-year scholarship, simply because coaches want to continue to have life-or-death power over their charges? How can the labor force that generates so much money for everyone else be kept in shackles by the N.C.A.A.? Which side of this debate are UO athletics director Rob Mullens and our Faculty Athletics Representative Jim O’Fallon on? The side that preserves their salaries and perks. Email exchanges between Glazier, Ron Barker, Pac-12 associate commissioner for governance and enforcement; Steve Duffin, NCAA associate director of enforcement; Angie Cretors, NCAA associate director of agents, gambling and amateurism activities; Bill Clever, UO executive assistant athletic director for compliance, and James O’Fallon, UO law professor emeritus and the athletic department’s faculty rep.
Here’s a taste of the emails, more later. Everyone knows Kelly paid Lyles for Seastrunk and the other Texas players, the question is whether the evidence is so obvious the NCAA can’t ignore it, or whether the AD could come up with some scapegoat to take the fall for Chip Kelly. That seems to be getting harder given how much coach seemed to love chatting with Lyles. We paid “The Cleaner” Mike Glazier $75,000 in student tuition money, but things still look dirty. Solution? Quit the NCAA and start our own “League of the Violators”. USC is in, and now Penn State, any other freedom fighters? At Penn State, it was even worse than prostituting education for the sake of a football powerhouse. The entire old-boy system in that university managed to overlook the possibility that children’s lives were being ruined, within the dangerous cocoon of King Football. We need to look beyond the alleged abuses. We need to look at the system that encouraged people to look the other way. Really, we need to do something about big-time college sports. Cocoon is right. Step one is sunshine and transparency. Lariviere promised this after Bellotti. We’ve seen some sunbreaks, but it’s still a long painful fight to get even the simplest financial details from our department. For NCAA infractions, the position of our misnamed “Faculty Athletics Representative” Jim O’Fallon is simple: the faculty do not have a right to know what is going on inside the athletic department. He, AD Rob Mullens, and “The Cleaner” Mike Glazier will take care of it. O’Fallon has had the FAR job for 23 years now. He is paid $187,729 at an 0.5 FTE – plus travel to games, etc. Cushy. A guy would hate to give up a deal like that by asking uncomfortable questions. This is not how you do effective oversight. The faculty is supposed to review his performance every 5 years. We never have.